The first record we have of bells in the history of Christ Church is dated 1825 for a single bell, subsequently altered in pencil to two bells, which is known to have been the case in 1830. Both Mr Morley and Mr Taylor are recorded on the Benefactors board now hanging in the community room but Mr Taylor is referred to as “Thomas”. Nothing more is known about him. The history booklet also reports that the bells were first rung in 1866 at the opening service conducted by the Bishop of Ripon for the installation of a new organ- itself costing £266 9s 6d. This was due to a new manufacturing process based on a German invention being introduced at Millsands Mill, Sheffield by Colonel Tom. E Vickers who emerged as the head of the crucible industry and founded the famous “Vickers” steel company. We have recently discovered a paper “Colonel Tom and his Cast Steel Bells ” which describes this manufacturing process in detail, and the features which attracted the customers to purchase this new technology. 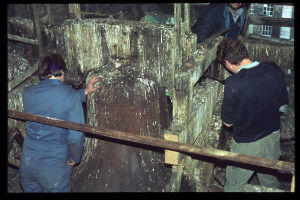 In 1983, dry rot was found in the west end of the church and tower, and for safety reasons the bells had to be removed. 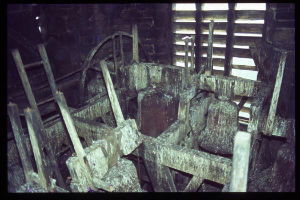 They were sold and subsequently stored at Andy Thornton's architectural salvage, for many years. When clearing out the storage yards prior to moving premises, Thornton’s considered scrapping them as un-sellable, but they were bought “very cheaply” by Beamish Museum, County Durham. 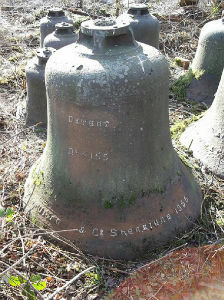 Staff at Beamish have kindly photographed them for us using chalk to make the patent number and inscription on bell no. 7 isible. Members of our current congregation cannot remember the full peal of bells ever being rung. They do remember that one, (possibly the small bell), was used for calling people to church and for funerals. 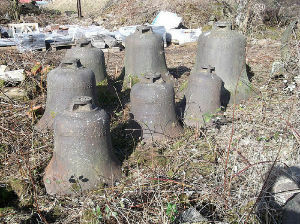 The small bell has been made into a collection point in the entrance of the museum, whilst the other 7 (pictured above) are held in storage. The bells have now been pronounced “tonally dead”. Like the Victorians before us, we have looked to new technology as a cost effective solution to restore a “voice to Christ Church. The digital Bell Sound system now installed at Christ Church is supplied by Smith of Derby Ltd. Their 150 years expertise in heritage clocks (including those with chiming bells) led them to develop electronic techniques to sound real bells and create digital bell sounds. 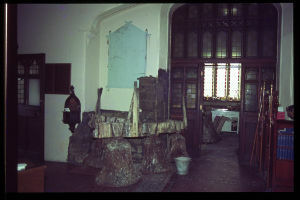 They first installed a full Bell Sound system in Derby cathedral in the mid 1980’s. The system reproduces the sound of traditional church bells with a number of differently programmed peals, with the subtle harmonic resonance of the original bells. A demonstration system to gauge the community’s reaction was in place on 5th December 2015. When Sowerby Bridge was hit by dreadful flooding on Boxing Day, Christ Church opened its doors to help the community in any way it could. Unlike other towns in the Calder Valley, Sowerby Bridge had no automated flood siren and we were asked if the newly proposed system could be used in any way as a warning. In addition to the standard choice from a single bell tolling, to traditional peals using 8 bell notes or hymn tunes, we commissioned a bespoke alarm of two bell notes , with a battery back up in case of power failure. 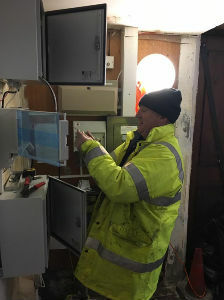 We were able to install the system on 8th December 2016 as part of our role as a support hub from the Calderdale Communities team and with additional grant funding from the Community Foundation for Calderdale. It is now being incorporated into the flood response plan by the Environment Agency and Sowerby Bridge Flood Wardens. 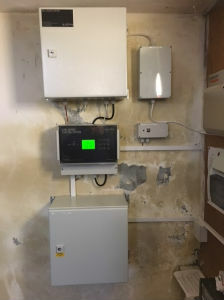 The control panel and sound amplifier is now fastened securely to the fabric of the church tower at ground level in the South Porch and the electrical wiring travels up the height of the tower. 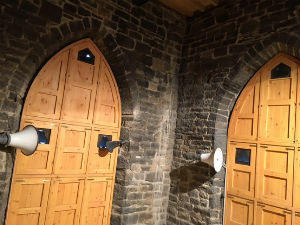 Three full size speakers are now fastened permanently in the original belfry, one to each of the South, West and East elevations and positioned to direct maximum sound wave to the town below, through the mesh screens in exactly the way that the sound waves of the old bells travelled from the tower.